As promised, we are going to spend this edition of the PopCult Toybox looking, in random order, at some of the new toys unveiled last weekend at The New York International Toy Fair. Actually, there was way too much stuff to cover in one post, so this cursory overview of toys in our future will be split into two or three installments. My Little Pony is one of the hottest properties going right now,and Hasbro had lots of news to keep the “Bronies” happy. 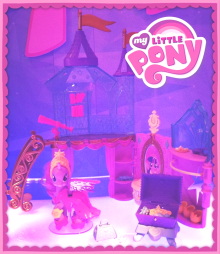 The HUB is preparing a new season, and they promise that Twilight Sparkle will still be on hand, just as a princess. Some of the Ponies that have been missing in action will return. 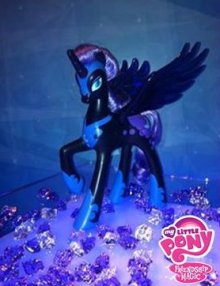 There will be lots of collectible new Ponies to tie in with the new episodes of the show (with a musical episode coming next week) and the hit comic book from IDW. The theme for Transformers this year is “Beast Hunters” which will run through all the toy lines and comics. New figures in the line will include Beast Hunters incarnations of Soundwave, Prowl, Gun-gurrr, Starscream, Shockwave and tons of others in many different scales. 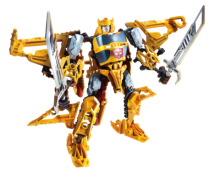 There will also be Transformers Construct-bots, which can be built and converted to different modes using a modular system that will let folks mix and match which parts they use on which Transfomer. There will also be an extensive 30th Anniversary series of Transformers. Last, but not least is Transformers Titan Class, a series of gigantic 24″ Transformers that will retail for $125. Kre-o is Hasbro’s Lego-like construction toy line, and in the coming year it will expand with new sets based on Transformers, GI Joe and Star Trek. Of note to GI Joe collectors is the presence of an Adventure Team Land Adventurer and Commander among the multi-packs of tiny “Real American Hero” characters in a set that is exclusive to Toys R Us. GI Joe’s 2013 offerings are dominated by the toys tied to the “GI Joe Retaliation” movie that was yanked from distribution three weeks before it was to open last summer so they could reformat it as a 3D movie, and maybe shoot some new scenes that un-kill one of the more popular characters. The toys are a disappointing lot for collectors of traditional GI Joes. 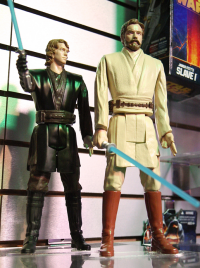 The 3 3/4″ figures are all movie-based and bear the likenesses of the actors. There is a totally nonsensical series of 10″ action figures, a size which has never been used for GI Joe at any time in the forty-nine year history of the toy line. There are three cheap new 12″ figures, which appear to have fewer points of articulation than any 12″ GI Joe figure has ever had. Unless there are concealed and unannounced click-joints at the knees and elbows, these puppies only bend at the neck, shoulders and hips. The likeness of Duane “The Rock” Johnson as Roadblock looks more like Tiny Lister and Eddie Griffin had a kid. As we mentioned last week, Hasbro will also offer full toy lines based on Spider-man, Wolverine, The new Iron Man movie, a re-invigorated Star Wars and The Avengers. These will be competing for shelf space with last year’s unsold Marvel and Star Wars figures. There will also be 12″ figures of Wolverine, Iron Man and Spider-man and some Star Wars characters , but they boast “five-points of articulation,” which means that they are going to be pretty lame. 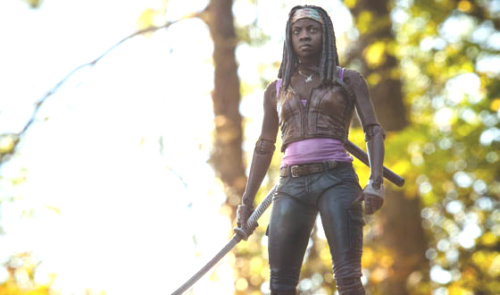 McFarlane Toys unveiled the third series of AMC’s The Walking Dead action figures. They promise 3D scans of the actors so that the likenesses will be uncanny. The five figures in this assortment, which will hit Toys R Us, Game Stop and hobby outlets next month are Michonne, Merle Dixon, Autopsy Zombie, and Michonne’s Pets. Barbie’s big deal in 2013 is her moving out of the Malibu Dreamhouse. Over the next few months, Barbie will embark on a nationwide search for a new house that is in no way just a publicity stunt to promote the Barbie website. New Barbie items in stores include a Mega Bloks Barbie Mansion building set, Barbie with Color-Chalk Hair, The barbie Digital Dress Doll, A Pony Tale Train and Ride set with Barbie, her younger sister and two ponies, Life in the Dreamhouse Fashion Vending Machine, two new Talking Barbies, and just in time for Christmas, a Brand-new Barbie Dreamhouse. Next week we’ll look at even more new toys coming your way, including a brickhouse full of LEGO news and previews of Monster High, Collectible Barbie Dolls, Max Steel and more.